More than 45,000 patients treated, every one unique. 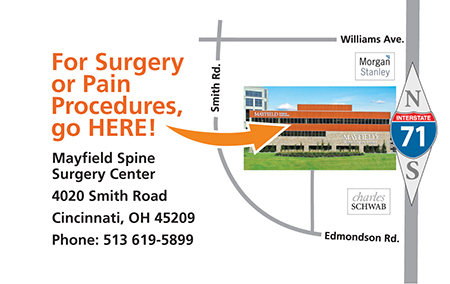 The Mayfield Spine Surgery Center offers state-of-the-art minimally invasive outpatient spine surgery and pain management procedures in a comfortable, patient-friendly environment. 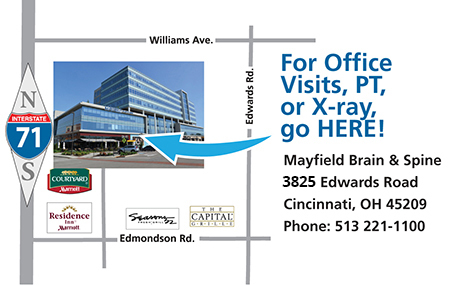 Over the last 10 years, specialists of Mayfield Brain & Spine have performed more than 13,000 surgeries at the center and more than 34,000 procedures. Experienced, caring, and dedicated to each individual patient, our physicians and staff represent one of the most trusted names in neurosurgery. Find out more here, or schedule an MRI review at no cost to you. At the Mayfield Spine Surgery Center, patient safety comes first. Be sure to arrive at the correct Norwood location! Dr. Orlando is a physiatrist specializing in interventional spinal treatments and therapies. Learn more about Dr. Orlando. Dr. Kachmann is a board certified neurosurgeon. Learn more about Dr. Kachmann. Mayfield's Dr. Tann Nichols discusses spinal cord stimulation for chronic pain. If you have been suffering from chronic pain in the lower back, leg (sciatica), or arm for 3 months or more, you may be a candidate for a spinal cord stimulator.